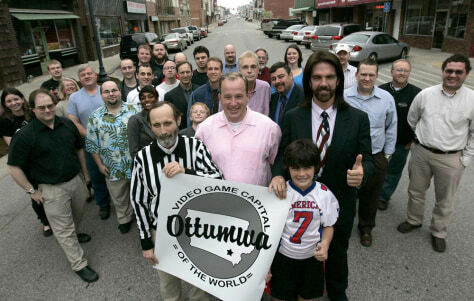 The good folks of Ottumwa, Iowa, insist their town really is the video game capital of the world. And to prove it, they're inducting the first round of video game luminaries into their new International Video Game Hall of Fame. Key players in the town's gaming history include, in the foreground, Twin Galaxies founder Walter Day (left), classic game champ Steve Sanders (center) and Billy Mitchell (right), the first person to achieve a perfect "Pac-Man" score.